Managers are now making plans for the summer transfer window so we’ll bring you all the latest news and gossip from around the globe. Today, Man Utd are linked with Antoine Griezmann…. Manchester United will trigger Antoine Griezmann’s £85m release clause this summer as Paul Pogba tries to persuade the Atletico Madrid hitman to swap Spain for England, according to the Telegraph. Jose Mourinho resisted the temptation to dip in to the January market with the United boss instead opting to save himself for a busy summer of activity as he looks to turn his squad in to genuine title challengers. A new top class forward looks to be on the agenda as Wayne Rooney is expected to leave Old Trafford after falling out-of-favour while Zlatan Ibrahimovic is yet to sign an extension to his contract which expires in June. The Telegraph claim that while Everton’s Romelu Lukaku and Monaco’s Kylian Mbappe are on Mourinho’s radar, Griezmann is United’s prime target and the club will table a formal £85m bid to trigger the 25-year-old’s release clause this summer. The newspaper says that United have been encouraged that a deal with the striker could be agreed following talks with intermediaries and with few clubs able to afford Griezmann’s transfer fee, Old Trafford is the French international’s most likely destination if he decides to leave Atletico. 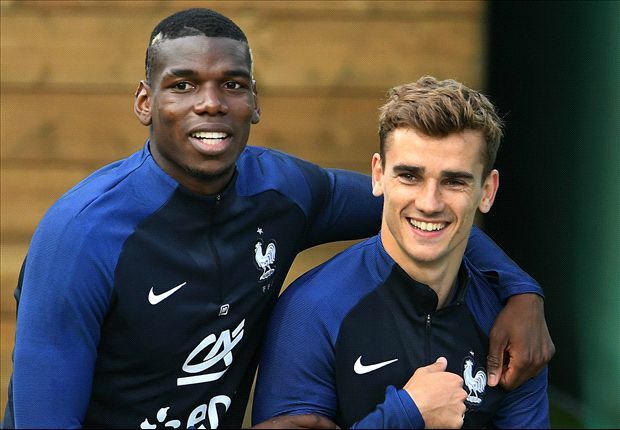 Griezmann has expressed his concerns over moving to England due to our unfavourable weather compared to the Spanish climate, however, the report claims that Pogba has been sending his international team mate regular messages to try and reassure him the weather in Manchester isn’t as bad as he fears. Obviously United fans would be delighted if the club could lure Griezmann to the club as he’s developed in to one of the best strikers in the world since joining Atletico in 2014 having scored 79 and provided a further 24 assists in his 147 appearances so far. He would be a truly world class signing for United and it would be great to see a player of his caliber plying his trade here in the Premier League as he could only be a superb addition to English football. However, the main obstacle which could derail any proposed deal would be if United fail to qualify for the Champions League next season so Mourinho will be desperate to finish in the top four or win the Europa League.